Tinner Corp. plans to take advantage of the latest technology available on-line, by providing both consumers and businesses with an on-line hospitality service called Hospitality Works. Hospitality Works will provide consumers seeking hotel, travel and restaurant information a "one-stop shopping mall ", where they can obtain information, buy, sell and make reservations on-line. The service will also enable those in the hospitality industry business to buy and sell goods in a more efficient and cost effective manner. By taking advantage of available technology and targeting a specific market segment, Tinner Corp. has developed a successful and profitable plan for their business. Tinner Corp. is a start-up company founded by experienced entrepreneurs that is seeking additional investment to support the development and marketing of its product, Hospitality Works. Hospitality Works will be the first on-line service in the marketplace that services the world's largest vertical market, the hospitality industry, with the tools being provided by a competitive manufacturer of software, Goldmine Corporation. Hospitality Works will be accessible on Goldmine Online. Due to be released in August 1995, Goldmine Online is projected to capture millions of new subscribers on its network in just the first year, which will make it one of the largest commercial on-line networks anywhere. All segments of the food, beverage, and lodging industries ranging from single-location restaurants and inns, to international chains as well as their suppliers will have on-line local access in 45 countries. Members of Hospitality Works on Goldmine Online will find it easy and inexpensive to travel the world of electronic information. Members will be able to buy and sell worldwide, reserve hotel rooms, hold real-time chats, attend on-line classes, review resumes, post menus, and research the latest trends through electronic extensions of industry publications. The Tinner market strategy is based on being first to market, promoting the solid Goldmine partnership, creating a world-class organization teamed with high-value content providers, designing the product for growth, and aggressively marketing the product. Already, Tinner has been contacted by over 500 firms, from the largest in the industry, to some as far away as Saudi Arabia. Ralph Cunningham, President of Goldmine, demonstrated Hospitality Works to an audience of 700 food industry CEO's on May 3, 1995, during his keynote address. With its projected customer base, Hospitality Works is expected to grow to $36 million by its third year. The primary revenue generating services will be on-line supplier purchases, worldwide hotel reservations, private company forums, and advertisements. The company President and CEO is Lucy Tucker, who opened her first successful restaurant when she was 22 years old and since has earned a reputation as a visionary in the hospitality industry. Ms. Tucker has provided about $300,000 in seed capital which has enabled product development since November 1994. At present, Tinner is the only Independent Content Provider designated as a Goldmine "aggregator" for the hospitality industry. As such, Goldmine has been referring companies of all sizes related to the hospitality industry to Tinner. Tinner Hospitality Corp. is seeking investment for development, staffing, marketing, and operation of Hospitality Works. To be the first to the marketplace with a service that merges together the world's largest vertical market, the hospitality industry, with the tools being created by one of the fastest growing markets, the commercial on-line network industry and the Internet. To closely partner with Goldmine and directly benefit from the anticipated dramatic sales of and world-leading products from Goldmine Online. To develop a lean, dynamic organization that has the tools to grow with the market and create strategic alliances with successful organizations that enhance and expand Hospitality Works services. Hospitality Works, developed by Tinner Corp., is an on-line service much like Big Co., Internext and Starnet, but it is specifically dedicated to serving the needs of the hospitality industry. Hospitality Works will be available on the forthcoming Goldmine Online. Subscribers to Goldmine Online will have on-line local access in 45 countries. Upon its launch in June 1995, Hospitality Works will be a leading, globally accessible on-line service effectively serving all individuals and organizations involved in foodservice and lodging. Hospitality Works is being designed to closely emulate At-Your-Fingers for ease of use. Access to Hospitality Works will be through two entries on Goldmine Online. One will be found under the Travel & Vacation folder on Goldmine Online and will be targeted to the consumer. The other entry will be found under the Marketplace folder and will be targeted to businesses. Tinner projects most of its revenues will come from the business customer. Tinner likens Hospitality Works to a shopping mall where Tinner is the landlord who enables the commerce and ease of access, and businesses are the tenants that conduct the actual business. Consumers and businesses find this concept of "one-stop shopping" to be convenient and compelling. Moreover, businesses will benefit from conducting their operations faster, better, and cheaper through on-line communications. Hospitality Works will enable faster and more accurate communications with their customer base, improve efficiency in internal operations, and improve convenience for employees, customers, and the end user. In short, Hospitality Works will make good business sense. Hospitality Works offers a wide variety of services. Over 90% of the projected revenues will be generated from four basic services: on-line links to suppliers, worldwide hotel reservations, private company forums, and advertisement. A user of Hospitality Works can see a picture of his hotel before making his own reservation on-line, buy supplies at the click of a button and electronically shop around for the best price, send private messages to his employees scattered around the world, and advertise his company from a visually compelling multi-media home page. Buying on-line will enable suppliers to service their customers at a far lower cost than any other method currently being used. Tinner is committed to providing the best value-added services to its customers on Hospitality Works. Hospitality Works is currently up and running on Goldmine Online. Of the approximately 150 independent content providers currently on Goldmine Online, Hospitality Works has been cited by Goldmine as one of the most mature and highest quality forums. Lucy Tucker was featured in Business Time praising the pricing model Goldmine Online proposed for its forthcoming on-line network. Tinner had a major exhibit booth at the U.S. Restaurant Convention in June 1995 and hosted its first set of public live demonstrations with on-line chats with Chef Kirby Beneville and Chef Joe Markell. Goldmine participated with staffing and technical help. Ralph Cunningham, President of Goldmine, demonstrated Hospitality Works to an audience of several hundred food industry CEO's in St. Louis on May 4, 1995 during his keynote address. Tinner was invited to present Hospitality Works to an audience of 2,000 people at Goldmine's Systems Conference in San Francisco in August 1995 where Ralph Cunningham also spoke. Tinner has been contacted by over 500 organizations, including major hotel corporations, food manufacturers and restaurant chains, who are interested in Hospitality Works as potential users or suppliers. Hospitality Works is targeted to the hospitality industry, one of the largest vertical markets in the world. The target market includes restaurant and hotel operators, hospitality suppliers, professional associations, trade publications, consultants, universities, cruise lines, vending firms, bars, cafes, caterers, and food service operators for health care, business, and the military. In the U.S. alone, the hospitality industry was estimated to generate over $300 billion in sales in 1995 with about $230 billion from foodservice and $70 billion from lodging (ref: Dept. of Commerce). The hospitality industry is increasingly using advanced computers and communications to enhance its products. The single greatest growth area in the hospitality industry is information and technology expenditures. In the U.S. foodservice segment alone, technology expenditures are expected to surpass $590 million in 1995 according to Food News. Over 80% of all hospitality businesses utilize personal computers with Goldmine products as the operating environment of choice. The research firm Infosearch projects that 28 million units of Goldmine Systems will be sold in the first four months after its June 1995 launch and over 200 total units through 1999. Browntown estimates 30% of At-Your-Fingers purchases will result in a subscription to Goldmine Online given its experience with free trial offers. As a result, based on Infosearch projections, Browntown estimates 9 million people will subscribe to Goldmine Online by the end of 1995 (28 million units times 30%). More conservative estimates have ranged from 1 to 2 million by end of 1995. In either case, Goldmine Online could overnight become the leader in commercial on-line services. The current leader is Homeplate On-Line with over 2 million subscribers and 6 million total between Neophyte, Samson and Compit. Goldmine's marketing strategy is targeted to the vast majority of U.S. households that do not currently subscribe to any on-line service. For example, although 40% of At-Your-Fingers (AYF) users have modems, fewer than 10 percent of users of AYF and 4 percent of U.S. households subscribe to on-line services. On-line communications is still in its infancy within the hospitality industry. However, given that foodservice and lodging organizations usually consist of numerous operating units dispersed by long distances, the use of on-line communications is becoming an increasingly attractive business tool. Tinner believes the low cost of Goldmine Online, its ease of use, and its wide availability through AYF will make it the platform of choice for the hospitality industry. First to Market - Hospitality Works will be the first on-line provider focused on exclusively serving the hospitality industry. As a result, Hospitality Works has been given the special status by Goldmine as the "aggregator" for the hospitality industry. As an "aggregator", we provide Goldmine the market and product expertise to achieve a significant volume of sales with an industry that has tremendous on-line service potential. Although such a title is not an exclusive arrangement with Goldmine, it will make Hospitality Works the on-line service of choice if one wants easy and early access to Goldmine Online. There is a growing recognition by the hospitality industry that Hospitality Works will be the only one-stop shopping service available in the near-term. This recognition has ignited an overwhelming interest in our product. There is a great sense of urgency among potential users and providers of Hospitality Works of not being left out of the coming revolution in on-line communications. As an "aggregator", Tinner will enable suppliers to service their customers at a far lower sales cost than is currently available. Ease of Use - Goldmine has assisted us in designing Hospitality Works to emulate the look and feel of At-Your-Fingers thus making navigating between AYF and Hospitality Works transparent to the users - providing a level of standardization and ease of use not available on other on-line services. Finding services on Goldmine Online is much easier than, for example, on the Internet. Powerful Development Tools - Goldmine has provided us with powerful development tools from which we will build the most visually appealing and functional services anywhere in the on-line industry. Superior Pricing Plan - Goldmine's pricing plan, which is much lower than any comparable on-line provider, will ensure the affordability of Tinner services in a hospitality market known for low margins. Also, Goldmine Online's low monthly fee will make it inexpensive for our customers to subscribe. Solidify Sub-Content Provider Alliances - Hospitality Works will be backed up by a powerful and high-quality team of sub-content providers. Currently we are in the process of selecting a sub-content provider for our hotel reservation system. We are also examining sub-content providers for the on-line buying service, for the news service, for managing about 20 individual forums, and for home page development and data storage. The sub-content provider will be selected based on quality of product, ease of use consistent with the AYF look and feel, ability to get service to market soon, good market reputation, in-depth market knowledge, and low product risk. Most importantly, no sub-content provider will be selected that undermines the position of Hospitality Works as an impartial and open provider of services. For example, we will not select a sub-content provider who competes with other users of Hospitality Works (e.g., a hotel operator, major food supplier), nor will we sign an exclusive arrangement with any user of Hospitality Works. Design Product for Growth - Tinner has designed Hospitality Works to grow with the dramatic increase in volume we expect, without a large increase in staff. Our use of advanced on-line tools and office automation and the leveraging of Goldmine and sub-content providers, will enable us to keep our organization lean and dynamic. If a service requires significant manpower to support it, we will outsource it. Aggressive Marketing Campaign - In order to take full advantage of being first to market, Tinner plans to aggressively market Hospitality Works through trade shows, trade publications, promotional events, and Goldmine itself. As mentioned above, Tinner and Goldmine have already generated a strong interest in Hospitality Works with over 500 inquiries received to date. Commercial On-Line Services such as Homeplate, Neophyte, and Compit. Many of these competitors have been in business a number of years but none currently offer content specifically targeted to the hospitality industry. Moreover, their pricing structure where they keep up to 90% of revenues generated makes it impossible to offer services such as on-line buying and hotel reservations where margins are very small. Tinner does not expect serious competition from this group. Some hospitality organizations such as the U.S. Dining Federation have invested their own funds to own and operate a BBS. A BBS has the advantage of providing a direct link to the customer. The downside for the BBS operator is the high cost of dedicated communication lines, constraints of using proprietary equipment, and the problem of owning hardware that can quickly become obsolete. The problem for the subscriber is its usual high cost and the inability to "shop" elsewhere. Tinner considers BBS to be a minor niche competitor. Quality - Goldmine backs up the quality of its on-line services, promotes those that prove successful and removes those that fail. Not so on the Internet. The user has to determine the honest service from the fraudulent. Ease of Use - The Internet user has to learn two operating systems on the Internet (the computer and the on-line service) versus only one on Goldmine Online. Browsing - Goldmine Online provides a clear roadmap for navigating to the customer's preferred service area versus Internet where one can get easily lost. Security - The security of business transactions is overseen by Goldmine whereas security on the Internet is dealt with on a hit or miss basis. Reliability and Support - Goldmine Online ensures the reliability and provides 24 hour support whereas there is no one to call for a problem on Internet. Low Up-Front Costs - Subscribers to Goldmine Online, and Hospitality Works will not have to invest in extensive hardware or personnel. In most cases, existing computer hardware will suffice. So overall, Tinner believes that Goldmine Online offers a superior product than does the Internet and other on-line service providers. Eventually, if and when the Internet does become "user friendly", we expect Goldmine Online to become the premiere site accessible by all on the Internet. Through our close alliance with Goldmine, we will continue to closely monitor competitive developments in the marketplace to ensure that the products we offer on Hospitality Works remain the highest value and highest quality at a competitive price. In keeping with Goldmine's pricing strategy, Tinner is also planning a pricing strategy that caters to mass accessibility. There will be no fee to access Hospitality Works beyond the low monthly fee required to be a member on Goldmine Online. Fees will be charged on specific value-added items. Tinner prices have been chosen to be competitive within the market and expect to adjust our prices as new competition emerges. To keep our costs down, Tinner will seek other sources for handling the billing and collection process. For example, Goldmine will provide billing for products sent through the network (i.e., on-line) and our sub-content billing for products delivered outside the network (i.e., off-line). Revenues are challenging to project because there are currently no on-line services that provide our product. Therefore, Tinner was very conservative with its projections. For example, revenue is based on U.S. data only, even though Tinner services will be available to the global hospitality industry at launch. Also, our projections do not exceed 1% of the market niches we aim to serve. Revenue projections are based on both top-down and bottom-up estimates. Purchasing On-Line ($13 million by third year) - Foodservice and lodging organizations will have the opportunity to buy goods on-line direct from the supplier. Suppliers will be responsible for uploading new pricing data at no charge. For every purchase, the supplier will be responsible for the billing, as well as paying Tinner a small commission. Currently, salesmen charge 1-3% commission in the foodservice business. Tinner is assuming only a 0.7% commission. Tinner is assuming $180 million in goods will be sold over Hospitality Works by the third year. This will create $13 million in revenue for Tinner (versus about $1.3 billion in commissions paid by U.S. restaurant suppliers annually). Worldwide Hotel Reservations ($10 million by third year) - Consumers and corporations will be able to browse hotels and book reservations through our on-line hotel reservation system. Tinner is in the process of selecting a sub-content provider who will provide the application which can best support this function. The sub-content provider will be responsible for development, maintenance, support, and billing for this service. Pricing will be done on a fixed fee per transaction. Currently, the market charges between $5 and $10 per transaction. Tinner is assuming the low of $5 per transaction. Tinner is projecting 2.0 million transactions by the third year. One hotel reservations company gave us projections of 2.5 million in just the first year. In the U.S., there are over 1 billion travel transactions per year. Tinner is also planning to generate revenue from hotels uploading their room information. The pricing algorithm will be a flat charge per upload times the number of individual hotel sites. Hence, a larger hotel chain will pay more than a smaller one. Private Company Forums ($6 million by third year) - Private companies can create their own private forums that could contain e-mail, purchasing, staff news, directories, training, employee manuals, calendar, employment opportunities, etc. Tinner plans to charge a one-time setup fee and a monthly maintenance fee based on number of sites included in the chain (i.e., the larger the company the more expensive). A basic template with some styling options will make it relatively easy for Tinner to service numerous requests. Tinner projects 400 private forums on Hospitality Works by the third year. Advertising ($5 million by third year) - Most of the interest today in on-line services stems from advertising. Research firm Infosearch projects over $ 1 billion in on-line advertising in five years. Tinner has assumed advertising revenue through four sources: home page ads, menu uploading, postings, and special events. 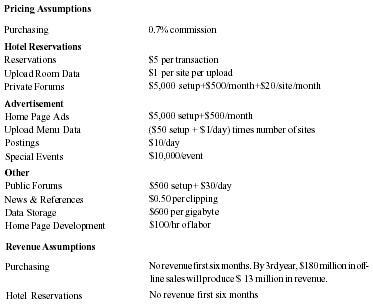 (1) Home page ads ($3.3 million) will be priced on a one-time set-up fee and a monthly maintenance fee. The current market charges between $1,000-$10,000 per month. Tinner assumes $500 monthly charge in anticipation that the market will become increasingly competitive. (2) Menu uploading ($0.8 million) will enable restaurants to easily advertise their current menus. There will be a flat uploading charge and a small daily charge for each site. (3) Postings ($0.7 million) could include resumes from individuals and training and career announcements from organizations. The charging will be based on a small flat daily charge. (4) Special events ads ($0.5 million) could include carrying a company logo on a Tinner home page or sponsoring a live chat with a hospitality celebrity. The charge will be a flat rate. There are a number of additional activities which could substantially raise revenue for Tinner. Public Discussion Forums such as classes and chat rooms with cover charges, etc., would be charged a set-up fee and monthly maintenance fees. On-line news retrieval services will also generate revenue. A major hospitality newspaper has already signed a letter of intent with Tinner. Other revenue sources could occur through outsourcing items such as customer mass data storage and home page development. Tinner Corp., located in Phoenix, Arizona is a subsidiary of the 10 year old Maison Rouge Co., a successful high-tech hospitality management company founded by Tinner's CEO Lucy Tucker. Tinner is leveraging the technology of on-line communications and office automation to keep the company small but effective. A key operating principle is that any activity which requires extensive manual labor will be outsourced to qualified organizations. This will enable Tinner to remain lean, aggressive, and focused. Tinner is organized around network operations & technical support, sales & marketing, and general & administrative activities. Tinner is planning to increase its staff to 35 individuals pending the infusion of additional investment funds. As revenues grow, we do not plan to substantially increase our human resources given the scalability of Hospitality Works to handle the higher volume of on-line activity. Lucy Tucker, 35, Chairwoman and CEO, Tinner Corp. - Ms. Tucker opened her first restaurant when she was 22 years old. Over ten years have passed and during that time Ms. Tucker has earned a reputation as a visionary in the hospitality industry, as chronicled in numerous feature articles. With a sharp business acumen and a lot of hard work, she has created three highly successful trendsetting restaurant concepts. She also served as Vice President of the Phoenix Branch of the Southwest Restaurant Association. Ms. Tucker learned early on that leveraging technology to her full advantage was the best way to achieve a competitive edge. Her high-tech pursuit of excellence has attracted the attention of the hospitality industry's top business figures. Ms. Tucker has proven her ability to consistently create and operate profitable businesses. Building on the success of her organization, she has assembled an impressive team of strategic partners and a talented staff who share her vision in Hospitality Works. Shirley Lake, 32, Director of Network Operations and Technical Support - Ms. Lake, the cofounder of Tinner, started her career in the microcomputer industry in the late 1970s. Led by the belief that the future for personal computers would revolutionize life in every way, she continues to dedicate her career to providing an organized framework for satisfying business needs with new technological capabilities. Working in many segments of the industry, including programming, technical information and sales, she has become a seasoned expert. As the owner of a successful consulting firm in Phoenix, Ms. Lake has consistently shown the ability to integrate technology in order to accomplish strategic business objectives. Ms. Lake is systems administrator for computing at Phoenix University. Sue Anthony, 40, Director of Hospitality Works Forums - Ms. Anthony is currently Director of Campus Dining at the University of Arizona at Phoenix, where she is responsible for $13 million in food services annually with 800 employees in 14 different locations. Her organization has received numerous awards including a recent national recognition for excellence in catering. Sue has made extensive use of computer technology for food service applications and is considered at the forefront in this field. She has consulted at all campuses at UA, as well as for numerous restaurants and non-commercial food services. Beatrice White, 35, Director of Marketing and Sales - Ms. White strengthens Tinner with her experience in executive corporate management, wholesale foodservices, and lodging operations. She was an Executive Vice President of a $50 million wholesale food distribution company. She was directly responsible for the sales and marketing with double digit increase in sales every year. She developed company budgets and several expense cutting programs that were extremely successful. She also currently owns a spa. Lydia Kumar, 37, Director of Business Planning - Ms. Kumar brings to Tinner her extensive experience in financial planning and business development for advanced technology programs. While at Iddings and Larson, a leading management consulting firm, she provided analysis and advice for clients seeking to exploit commercial markets in space. She also worked for Renu where she was a manager of marketing and product design in a $100 million venture to sell commercial launch services to private and public satellite operators. Ms. Kumar has a degree in aerospace engineering from Cal Tech. Seed capital has funded the research and development needs of Tinner since its inception in November 1994. $300,000 in seed capital has been provided by the founder and CEO Lucy Tucker. The funding will be sufficient to develop a functioning forum for Hospitality Works for its June launch. Tinner is seeking an additional investment of $4-5 million to complete development of Hospitality Works, expand the staff to 35 to service the growing demand of potential customers, acquire additional computer hardware and office space, and begin an aggressive marketing campaign to exploit our strategic advantage of being first to market. Funds are needed to get Tinner through the first year of operations, at which point revenues are projected to exceed cost. Purchasing No revenue first six months. By 3rd year, $180 million in off-line sales will produce $ 13 million in revenue. Upload Room Data By 3rd year, 30 hotels with 200 sites each updated bi-weekly. Private Forums No revenue first three months. By 3rd year, 400 forums with 10 sites each plus 250 setups (20% turnover). Special Events Two special events per month first year. By 3rd year, four events per month. News & References No revenue first two months. By 3rd year, 2,500 clippings per day. 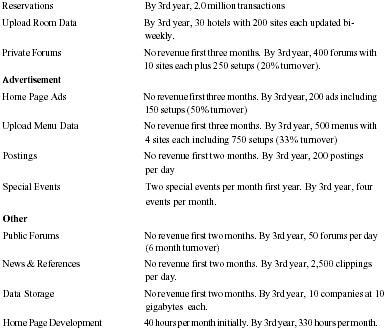 Data Storage No revenue first two months. By 3rd year, 10 companies at 10 gigabytes each. Home Page Development 40 hours per month initially. By 3rd year, 330 hours per month. Tinner - Given the scalability of Hospitality Works in handling varying volumes at little additional cost, Tinner's cost to each unit sold is very small. Goldmine - Costs for all Tinner products include a "subsidy" to Goldmine. Costs paid to Goldmine are subdivided into three categories with a different rate for each: on-line, advertising, and off-line. The terms on-line and off-line refer to how the product is delivered. For example, a cover charge for a chat room is considered on-line since the customer receives the product through the network, whereas purchasing restaurant supplies through the network is off-line since the product is delivered outside the network. Sub-Content Provider -Tinner plans to use a sub-content provider (i.e., subcontractor) for the hotel reservations and any other product that is manpower intensive or can be done more inexpensively elsewhere. We assumed hotel reservations, news and references, data storage, and Home Page development would be outsourced. Salaries Scalability of service requires little growth in manpower. Commission & Awards 2% of revenue. Equipment New workstations, fileserver and a mirror one, and other equipment upfront. Office Supplies $105,000 for outfitting of a 45 person office. Promotions Includes 3 major exhibits and 2 smaller ones at trade shows. Advertisement Ads in major lodging and restaurant periodicals. Travel 15 trips per month at $2,000 per trip first year.